Hello sweet friends! Spring has returned right? Maybe that’s why I can’t concentrate, it’s too, too lovely outside. I hope today finds you well! Today you get two card from me. I’m sharing this card for Day of Giving Friday here – read down below if you are new to Day of Giving Friday. AND, over on the Spellbinders Blog, I’m showing you step by step how to craft a special card full of hugs—–> Click HERE!! So much going on – I hope you’ll pop over there and give me your thoughts. Is it a card you could see yourself making? If you would, then let me know! So on to my card for today. Every once in a while I love a tall card (this one is 8.5″ tall by 4″ wide) – they are so different and really it is so easy to fill up the space, because of the narrowness. Today I’m highlighting one of my new borders Graceful Floral Lace. It takes up a lot of real estate on the card and that’s exactly what I wanted. I simply cut two pieces, backed them with silver foil and adhered the pairing to the top and to the bottom I stamped my sentiment from Quietfire Design onto vellum paper with Versafine Ink and heat embossed with clear embossing powder. 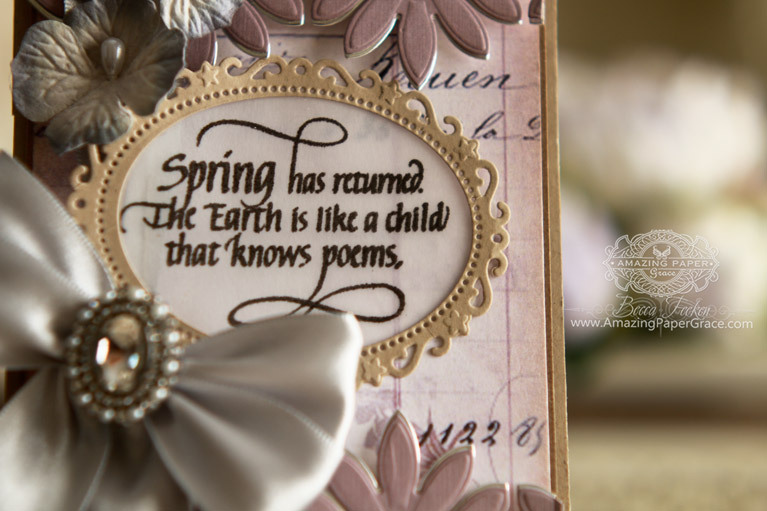 The sentiment is cut with Spellbinders Classic Ovals SM and framed with Spellbinders Floral Oval. The tiny filigree piece on the bottom is Spellbinders Corners and Accents One. For new readers, every Friday it’s my pleasure to give away a card. The card goes to a randomly picked reader (worldwide) who leaves a comment in our conversation. Want to know more about Day of Giving, here’s a link to my FAQ’s just check out #11. You can check the list of winners HERE! For your comment: I’m so loving the fact that spring is here! What’s your favorite part of spring? Happy Spring!! I just can’t say that enough – I hope spring lasts all the way to November. Seriously though, I hope you have a lovely weekend!! Another beautiful card!! I also saw the hugs card. That is so neat!! My favorite part of spring is the beautiful flowers that bloom nice weather and Easter. TFS I really like your new dies!! My favorite part of Spring is all the different shades of green…so full of life and accented with all the beautiful flowers…makes me want to thank the Lord and SING!!!! What a beautiful card! I love the sentiment..I have never heard it before. Oh my Becca you´ve just made another stunning card here, it´s sooo beautiful. Another beautiful card Becca.How I wish I had just an ounce of your creativity!! My favorite part of Spring is the Fresh Smell. I just want to go outside and take in the deepest breath and hold on to it and slowly exhale. I feel renewed. Wow! This card is so gorgeous! My fav part of spring–more daylight. Wow!! What a lovely card today and another beautiful sentiment too. The accent at the bottom is a beautiful finishing touch. Very pretty card, and I like the new border! Favorite part of spring? Seeing all the new and different greens come to life in the garden. Who knew there were so many shades of green? Every year I’m amazed all over again at the differences! So pretty against our NW rain! Wow, two for the price of one. For some reason I could not log in to the Spellbinder website to respond so will do both from here. I have the new dies except for the words so should be able to do that card! It is awesome. What a beautiful, stunning card today made with gorgeous dies. I love it. My favourite part of spring is new life. In flowers and animals, the lambs especially. 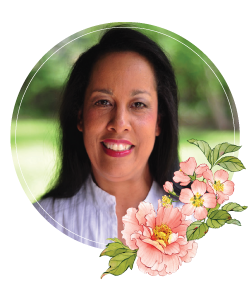 I love the freshness of Spring, the flowers blooming, everything turning green! The weather is perfect and it feels like everything is new! Your card today is so elegant and I am so impressed by the fact that you used a die from your border collection to create this more narrow card. I also love your HUGS card on Spellbinders website and the tutorial. I always benefit from your tutorials and videos so I appreciate the time you spend on these things for us. I wasn’t quite sure how to use the Hugs die so I really appreciate seeing you use it. This is a beautiful card! I love the tall dimension as well. I have lots of standard sized envelopes that I never use. Long and skinny is a great change of pace. And I love the lace design – it’s on my wish list! Very pretty to layer on the silver. Thanks, Becca! What a stunning card Becca. Absolutely love the colors!! I love flowers so much so they are a big part of spring, but the green grass and trees are so beautiful. After living all my life in California, I cherish the four seasons we now have in Indiana. You never need to water your lawn here and it stays green!!! Many of my cards have flowers… and my other favorite… butterflies! P.S. I’ve left my address in your contact email as a winner, but I don’t see the notation that you received my address. Where should I be sending my mailing address? Good morning Becca, spring is more daylight. Daffodils, snowdrops and crocus, pure heaven!!! Just like your card!!! I love DL cards they look so classy and this is gorgeous!!! O MY this is heavenly love everything about it ….. 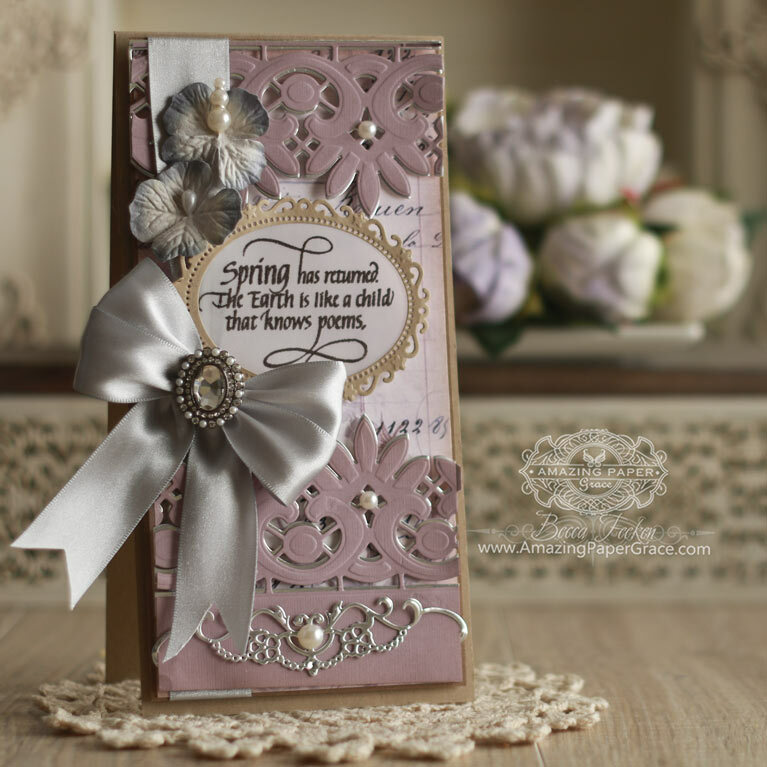 Stunning card and loved your card and tutorial on SPELLBINDERS! What a gorgeous card, Becca, so many wonderful details and lovely colors! This card is just gorgeous, Becca! Thx so much for sharing your wonderful talent with us! Love, love, love the cards!!! Each time you make a card I think “I need that die!” Of course, I can’t afford them all. Darn. This card is so different than your usual style and the color card stock you used inspires me to use the deeper colors of card stock I have that I never use. Hi Becca, Truly beautiful !! the colours are gorgeous, the die-cuts are gorgeous and the flowers are gorgeous !! I love Spring when all the little bulbs start showing their heads, it’s a ‘happy’ time. Oh Becca! This is beyond gorgeous! I just love it! Your card on the Spellbinders site is beautiful too. The frame maker is on my wish list! Spring is certainly on its way. My favourite part is to go out in the garden these lighter evenings, seeing the new shoots and finding those plants which have made it through the winter and are just beginning to wake again. The snowdrops showed a few weeks ago, the daffodils began to appear last week and blossom is out on the cherry plum trees. Just hope we don’t have a cold snap here in the UK to set things on their heels!